More pictures of the roebuck now installed in Monks Wood, including the sculptor and members of the Nettleham Woodland Trust management team and supporters. The sculpture was sponsored by the Lincolnshire Deer Group and carved by Nigel Sardeson. It can be found in a glade just off one of the main rides in Monks Wood, look out for it - and the real ones that frequent our reserve. ​With thanks to Rod Newborough and Susie Mendel for the photos. We had a very successful work day on Sunday 1 October, Nettleham Woodland Trust volunteers were joined on site by the Lincoln Conservation Group and some enthusiastic local people, making a working party of at least 25. The main two jobs were to remove the ash and prepare the site for the Cathedral Copse planting and to install the lovely new interpretive signs in the AAA. The recently planted ash at ALNR suffers from chalara, or ash die back disease and needed to be removed in a way that would prevent re-growth, so the volunteers dug down about 200mm and then chopped the tap root across. The holes were then back-filled. The self-sown willow was given a very short haircut to open the site up and then on each of the 120 sites for the new oaks the turf was turned over and a liberal top dressing of top soil applied to give the new trees a good start. When you pass the Cathedral Copse area, you will notice how different it looks! We are leaving the birch in to act as a protection for the young oaks. The planting day for the oaks is 26 November - more details in due course. There were oak posts prepared for the new AAA signs, huge and heavy! Rod, Susie and three tough LCG volunteers dug 500mm holes for the posts, levelled and fixed them with postcrete then back filled. When the signs went on, all of the work by NWT and Amy Sayer, the designer, was seen to to be well worth it - they look GREAT! 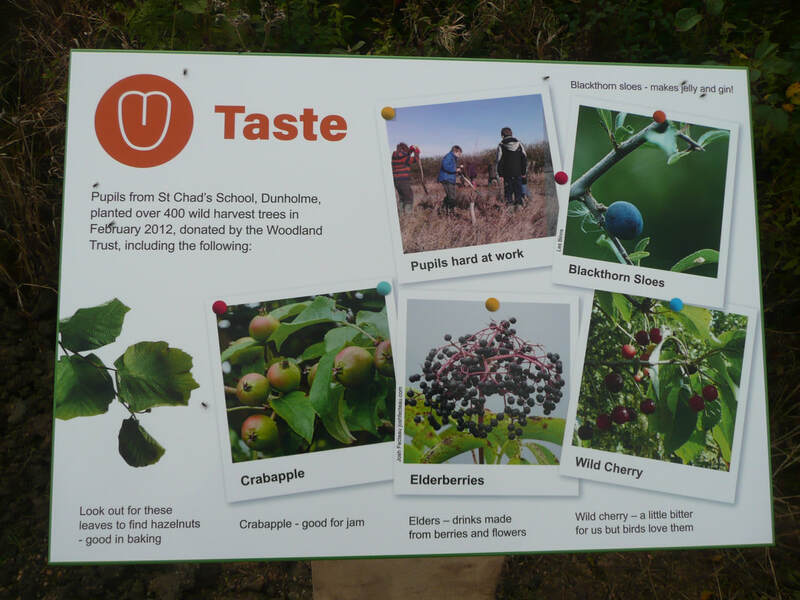 Thanks also to West Lindsey District Council for the funding for these and the new interpretation boards in the Threshold and at the north east corner of North Wood and Venture Signs in Lincoln for the printing and preparation of the final signage. The LCG volunteers even managed to give the willow tunnel a good trim. Thank you VERY much to all of them and Jeff in particular for leading the group. The Lincoln Conservation Group paid a visit to ALNR for a day of doing some jobs to keep the woodland up to scratch. 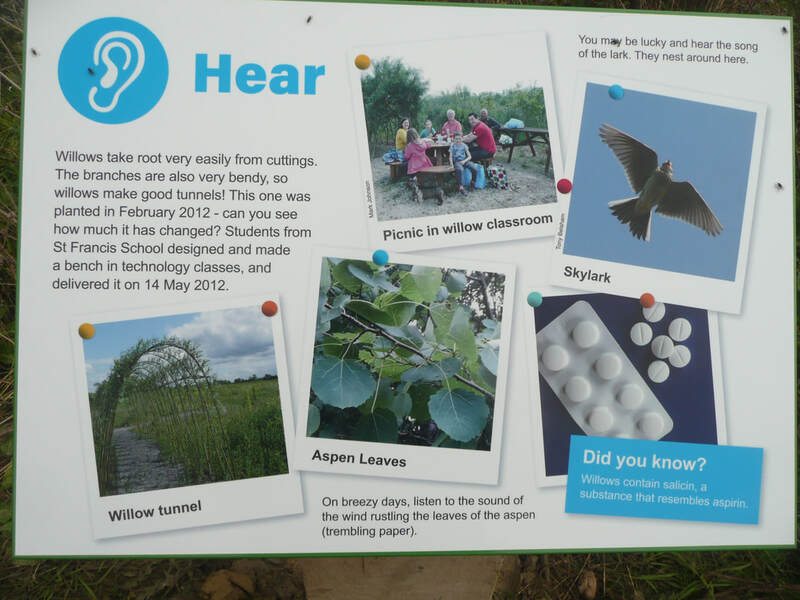 A lot was achieved: ditches dug, benches relocated, the willow tunnel tucked in, musk mallow planted, wood chip distributed. 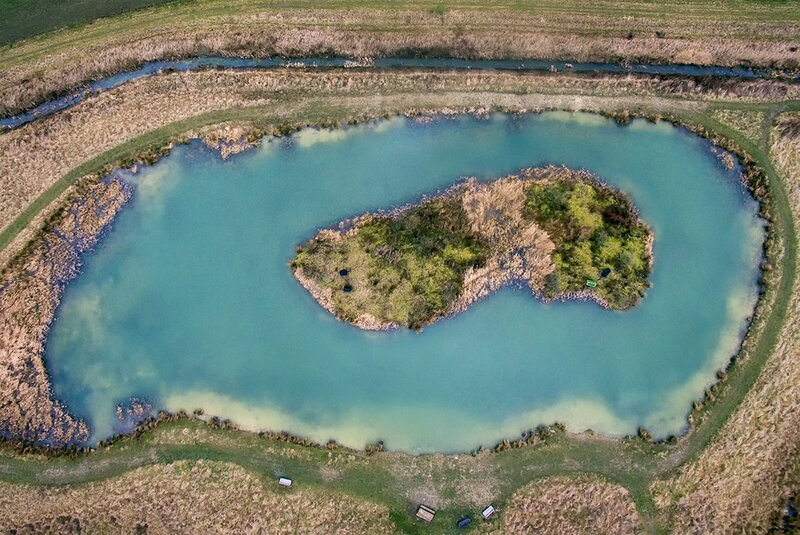 Mark Johnson has given us a completely new perspective on the lake in the Lincolnshire Co-operative Wood and the All Abilities Area - isn't this brilliant? Hopefully he will take more videos and pictures like these throughout the year to show the changes that the seasons bring. The latest work day took place on Sunday, 7th August 2016. Despite the absence of many potential labourers on their holiday, a baker’s dozen of NWT and LCV stalwarts turned up as well as a local lad trying voluntary work for the first time. The weather was glorious, a great advertisement for Lincolnshire ’staycations’. There were three main jobs, all in the more public parts of the South Wood . Some artistic types re-stained all the wooden benches and tables. Meanwhile several mighty diggers created new drainage channels leading away from the AAA Derbyshire stone path where it runs parallel to the main grass walk picking up the general downhill drift of surface water. Visitors will know how surprising damp this area can be. 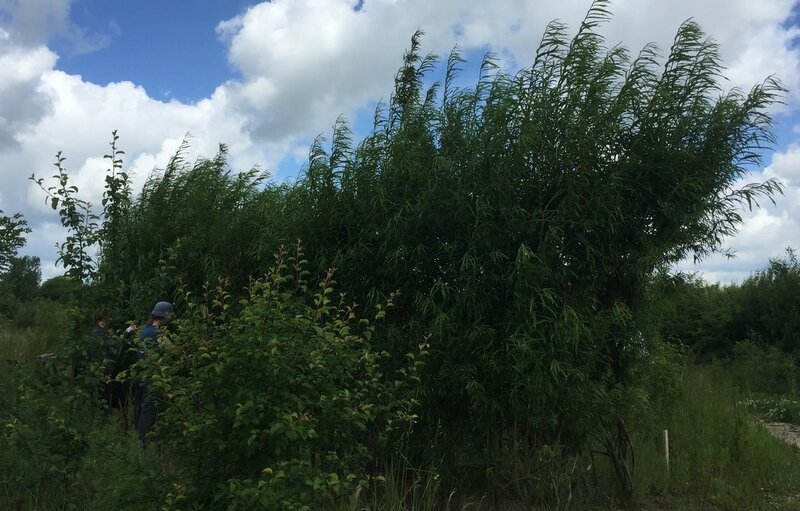 And finally a group of perhaps erstwhile hair-dressers gave a good trim to the main willow tunnel, The offcuts, some over 8 feet in length, were planted along a ‘desire line’ used by walkers keen to take a shortcut to the picnic table. Willow is a hardy plant and some of the 66 shoots salvaged from “the barbers’ shop” and replanted just a few metres away might actually take roots and grow in their new location despite the summer heat. And, if they don’t all survive, we will plant again in the more auspicious November-March period. It was a good session under the blue skies and the occasional fluffy white clouds of a quintessentially English summer’s day. Community working parties in the Ashing Lane Nature Reserve in June 2016. 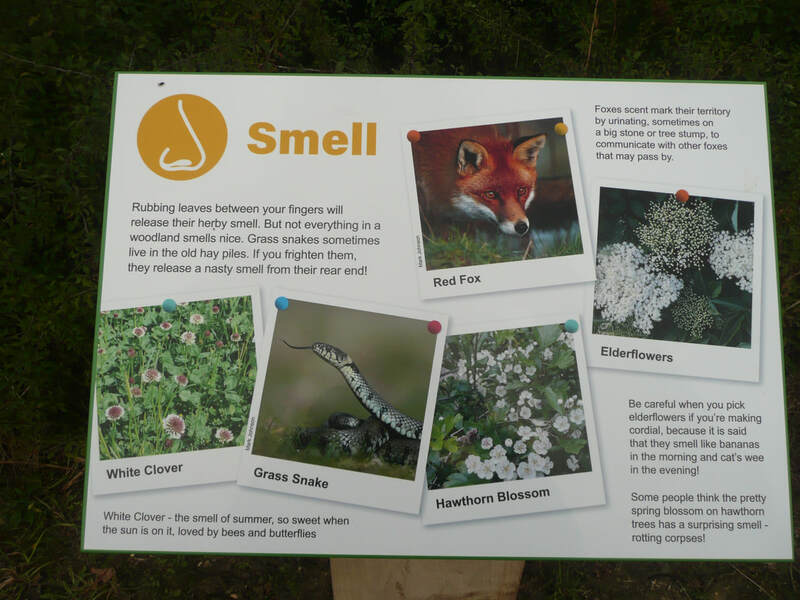 Eagle-eyed visitors to ALNR will have noticed the signs of spring. Rod Newborough has recently photographed evidence of a roe deer buck making a territorial claim in Monks Wood. The photo shows "fraying" where the buck has used its antlers to remove the bark and leave it's scent from glands at the base of it's antlers, in this case, on a crab apple tree near the All Abilities Area. 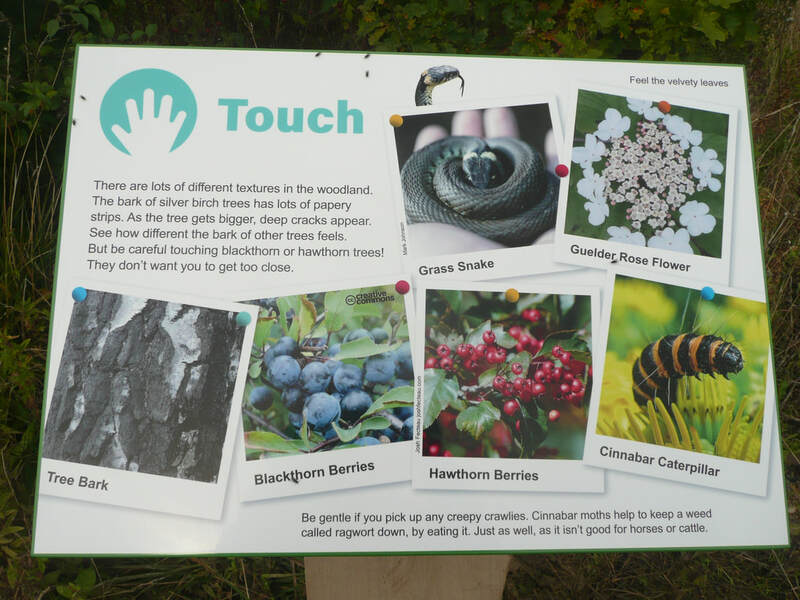 "They tend to choose a favourite tree and keep using it so don't damage a lot of trees. If the stripping encircles the tree then it will die, although crab apples are quite resilient," said Rod. 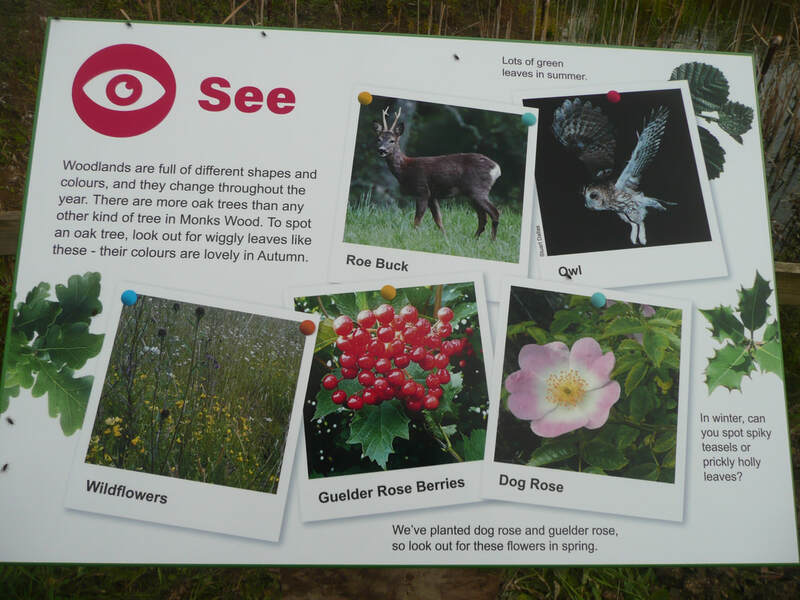 He also recommends that anyone interested in finding out more about roe deer visits the Forestry Commission's webpage. ​Look out for roe deer when you visit the woods. You will need to be really quiet and look carefully, because they are easily spooked. 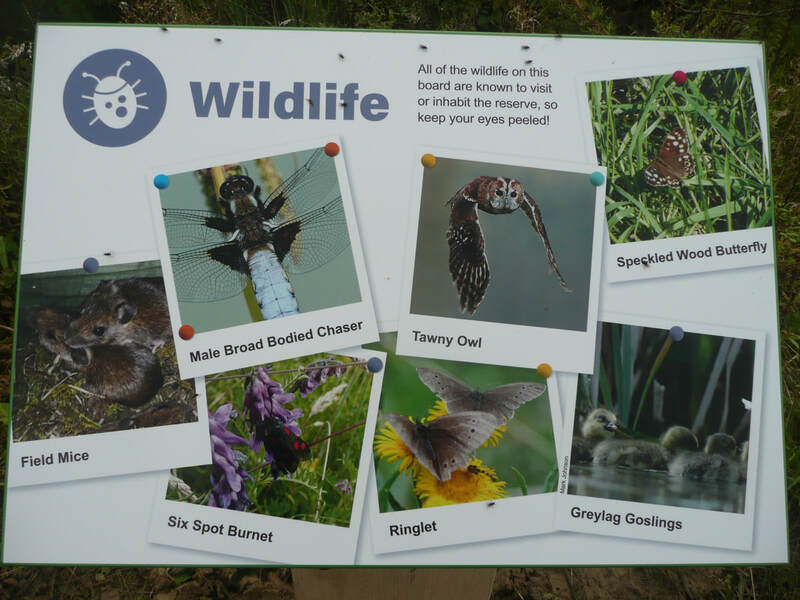 Make sure your dog is kept well under control at all times, as ground nesting birds and other animals and reptiles are starting to take advantage of the warmth to set up new families across the nature reserve. Working with the NWT Woodland Advisor, Rod Newborough, this girl learned about selecting, coppicing and preparing willow wands from the Coop Wood. Then she found out how flexible and useful willow is to make a structure, in this case an extremely effective wigwam. Or maybe an obelisk to grow plants through this summer? Just remember not to let the willow take root too strongly! The roof of Lincoln Cathedral is supported by massive oak beams, that, although they last for centuries, eventually need replacing. According to the Cathedral website, the oldest beams still in the building were 400 years old when they were felled and they were installed in the 12th century. 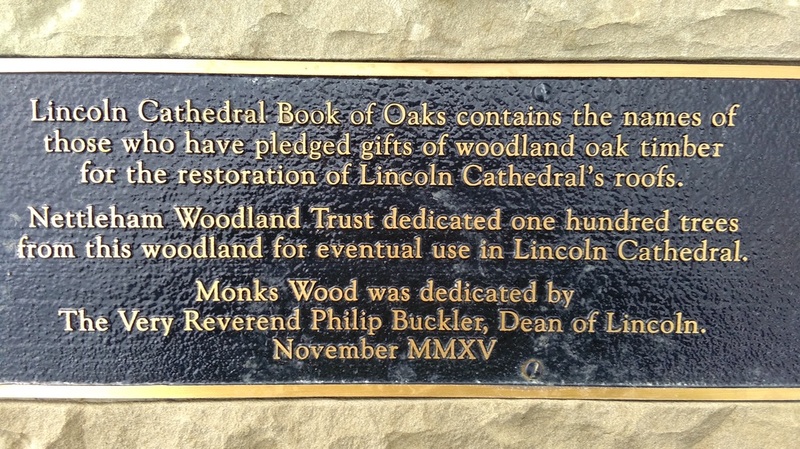 NWT has promised that eventually, when our oaks have grown a bit (in a couple of centuries), the Cathedral will be able to call on one hundred trees to use in the restoration of the roof. 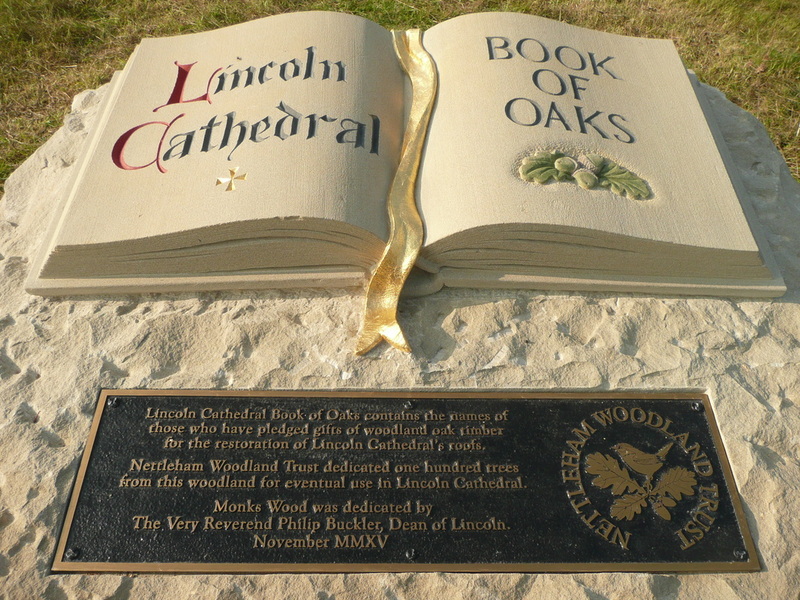 To memorialise this, a huge piece of stone donated by Farrar Natural Stone, has been carved by the masons of the Cathedral stone yards to represent the Book of Oaks and our commitment to them. It has been set in place in the south glade of Monks Wood. If you stand where you can read the pages of the book, you are looking in a direct line to the cathedral. 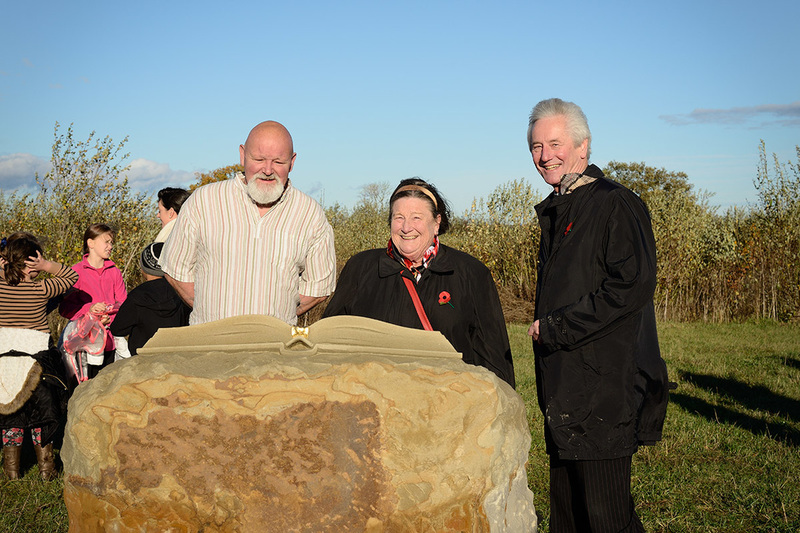 ​On a blowy but bright afternoon in November 2015, the Very Reverend Philip Buckler, Dean of Lincoln came out to unveil the stone formally and make the dedication.